Using bank statement projects when uploading your files allows you to manage the extraction and download of the completed statements. 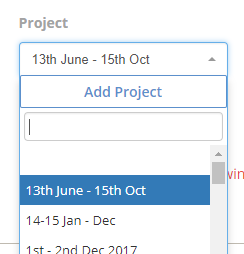 Before selecting the statements saved on your computer to upload, click on the Project drop down menu and either select a previously added project, or add a new one. Any files uploaded to the same project will be added to any previous extractions with the same bank account number. Therefore if you upload bank statements to the same project, AutoEntry will add the most recent uploaded statements to any previous extraction already processed. You can upload monthly statements each month to the same project and at the end of the year, download the full years worth of statements in one go. If you want to upload a months worth of statements and only want to download that months extraction, simply create a new project (March '17, April '17 for example) each time and those uploads will be kept separate from any other uploads even for the same bank account. Obviously, there's no extra cost for using or creating separate projects!